Warning: Don't share another link on Social Media until you watch this video! Start your trial today and STOP sending your clients to your competition! Update profile Info, upload Images, Set up Social Profiles. To build up your social profile and position yourself as an expert, you regularly post interesting articles from sources like the Globe and Mail, Financial Post and CBC. Your personal commentary and eye catching images entice your clients to click through and read the articles. Time to cheer! You have an engaged audience, right? Well, not quite. You may have just inadvertently sent your clients into the clutches of your competitors! As soon as your client clicks through to read the article, the media site displays advertisements for your competitors. These could be any combination of banner ads for rate comparison sites, big banks and even other articles disguised as news, but really designed to steal your clients away from you. This isn’t your fault, in fact most of us aren’t even aware this is happening. It’s just how the online marketing game is played. Bottom Line: Every time you post an article from a trusted news source, you are literally giving away your hard earned social authority to that new site, which then profits by selling the traffic (your clients) to your competitors. 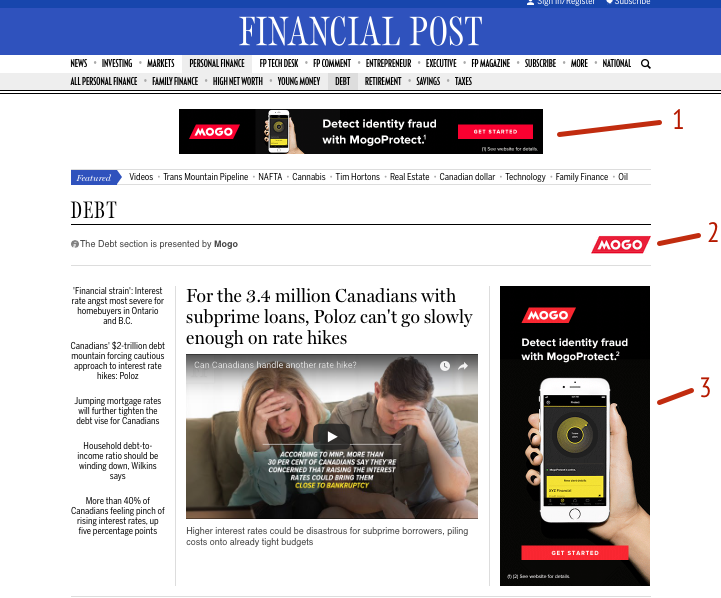 Financial Post sells sections to advertisers, currently, MOGO, who is a virtual mortgage brokerage, is the current sponsor and shows up 3 times during the article. 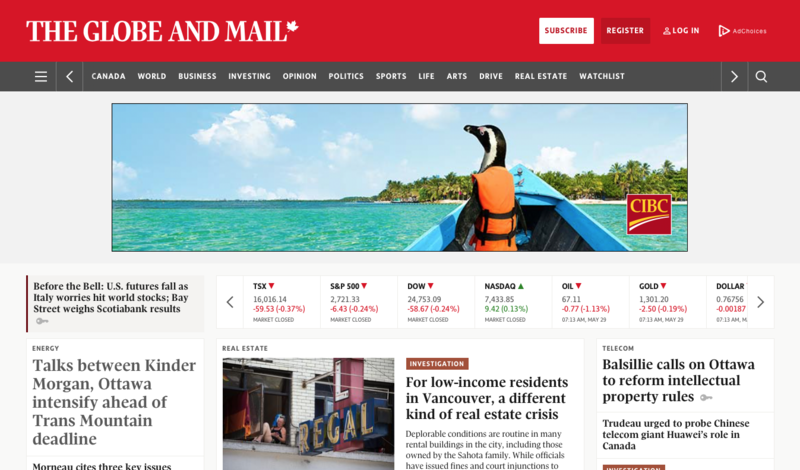 CIBC appears on the home page of the Globe and Mail, front and centre, no way your clients can avoid seeing this ad. Crush it on social media with our NEW Social Sharing tool for Mortgage Brokers! Take control of your client experience with your very own custom branded news site! Now you can share the same content you see on major media sites and display your personal brand along side every article without worrying about your competitors highjacking your clients. National syndicated news articles delivered to your inbox daily. Stop wasting time searching the internet for topical news to share on your social feeds. Our system delivers the most relevant industry articles to you automatically, every day of the week (Mon-Fri). Get personalized links to share on your social media sites, or let us post for you! Our system gives you unlimited ways to share... Post articles on all your favourite social media sites, add them to your newsletters, and even let us post directly to your LinkedIn, Twitter, or Facebook account 1-3 times a day. ​Use our content to build your brand, your way! Enhance your profile with your very own personally branded news site. You can fully customize the branding of your STREAM5 Social account. Include your email, phone number, address, company logo, featured image, and of course your headshot to build your brand awareness and stay top-of-mind. You retain full ownership of your clients and get all the leads from your social posts. Leverage our pre built lead capture tools to engage with prospects. You retain full ownership rights, and all new lead notifications are delivered to you immediately. No ads, no distraction, your clients only see the articles you want them to see! No annoying pop-ups, competitor ads or paid articles designed to distract your client. Just the information you want to share laid out on a beautiful site branded to you. I Love Mortgage Brokering was founded by Scott Peckford, a Kelowna BC mortgage broker who was looking to be a better broker. His original goal was to interview 100 successful mortgage brokers in 1 year to learn what made a successful broker successful. MortgageBrokerNews.ca is powered by Canadian Mortgage Professional (CMP) magazine, a monthly title that is Canada's leading independent magazine for mortgage brokers and professionals. The ONLY WAY to share 3rd party content without putting your clients in harm's way! Fully automated daily Done-4-U social media posting on Facebook, LinkedIn and Twitter. A combo of custom blog posts, plus syndicated financial & real estate articles from national media sources. Customize your profile with your contact information, upload your headshot, logo and featured image. Loads of past articles related to the mortgage industry that you can share anytime. Lead notifications and client contact details sent directly to your personal email. Share your article links in blog posts, emails, newsletters and social media feeds to enhance your brand. STREAM5 Social was built and designed for mortgage brokers, by mortgage brokers! Hi-quality downloadable reports & lead magnets engage your audience and convert them into leads. Visitors are linked to you. Any leads you get are owned by you and not shared... EVER! Jason is a serial entrepreneur and technology innovator in the mortgage, finance and real estate space. 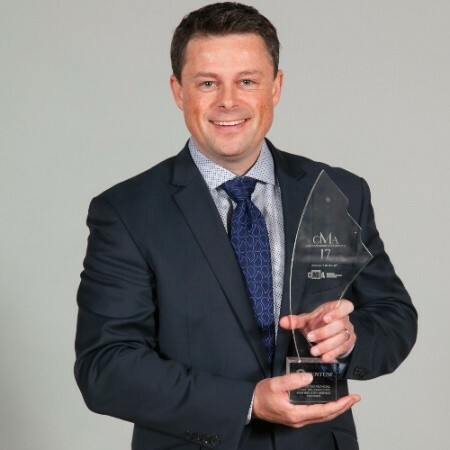 He is a 5-time Canadian Mortgage Award winner, including Best Marketing and Internet Presence, Product of the Year and Best Industry Service Provider. He has helped hundreds of Mortgage Brokers, Realtors and Wealth Professionals generate more than 70,000 online leads and over $15 million in revenue. Darryll has been behind the scenes developing some of the most popular mortgage tools for many years. 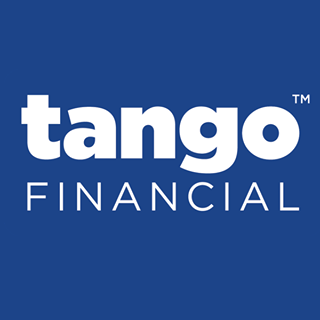 His experience as a financial planner and in branch mortgage advisor have given him critical insights to the industry , and allow him to build and design tools that provide mortgage broker with tools that provide real value to their daily lives. Thank you for your interest in the STREAM5 program. We invite you to try our program out for free for 7 days. Please provide all the requested information below. Please select a plan, please note that someone from our team will reach out to you during your 7-day free trial to gather your prefered payment method. Please have someone follow up with me to learn more about generating custom client reports, ongoing drip email campaigns, mortgage reports and other advanced CRM functionality. Please select the programs you would like to learn more about.